Beat butter and sugar with an electric mixer until light and fluffy. Add egg and beat well, then yogurt and zest. Put flour, baking powder, baking soda and salt into a sifter and sift half of dry ingredients over batter. Mix until combined. Sift remaining dry ingredients into batter and mix just until the flour disappears. Gently fold in your blueberries. The dough will be quite thick, closer to a cookie dough, which is why an ice cream scoop is a great tool to fill your muffin cups. You’re looking for them to be about 3/4 full. 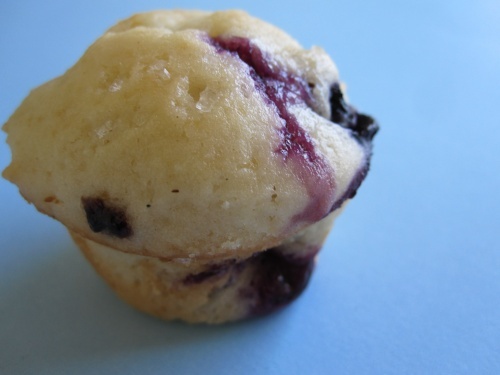 Bake for 25 to 30 minutes (more like 10 mins for minis), until tops are golden and a tester inserted into the center of muffins comes out clean. Let cool on rack or enjoy hot.